Tired of the same-old painted riflestocks? Once again Stocky's is bringing you to the forefront of modern stockmaking technology with these Iota exclusives! Our new Iota lineup features molded-in colors, hand layup fiberglass / carbon fiber construction, barrel channels up to and including the Proof Sendero (M24) and the standard inlets are designed fit both factory Rem 700 receivers as well as the modern crop of 700 clones (e.g. Defiance, Big Horn, Stiller). Focusing on mobility, the iota KRUX is iota's lightweight sporter style stock featuring a hand layup skeletonized body and compact size. Perfect for backcountry builds with Proof Research (as well as varmint and light sporter barrels). The iota KRUX is engineered unlike any other stock currently on the market. The lightweight sporter style stock’s skeletonized back end provides a unique design style while reducing overall weight which helps land this stock at only 27 ounces. The grip is less canted than a traditional stock providing shooter comfort and the thumb recesses encourage a correct grip for both right and left handed shooters. The barrel channel can accommodate more contour options than the traditional sporter stock including a Proof Sendero barrel contour, the pre-installed pillars help maintain accuracy focused structure, and the molded in ports avoid refinishing touch-ups. Products listed are In Stock, and will ship ASAP. If your product is not listed, continue placing your order and it will be shipped as soon as it's available. Need more information? Give us a call at (561) 584-8500. 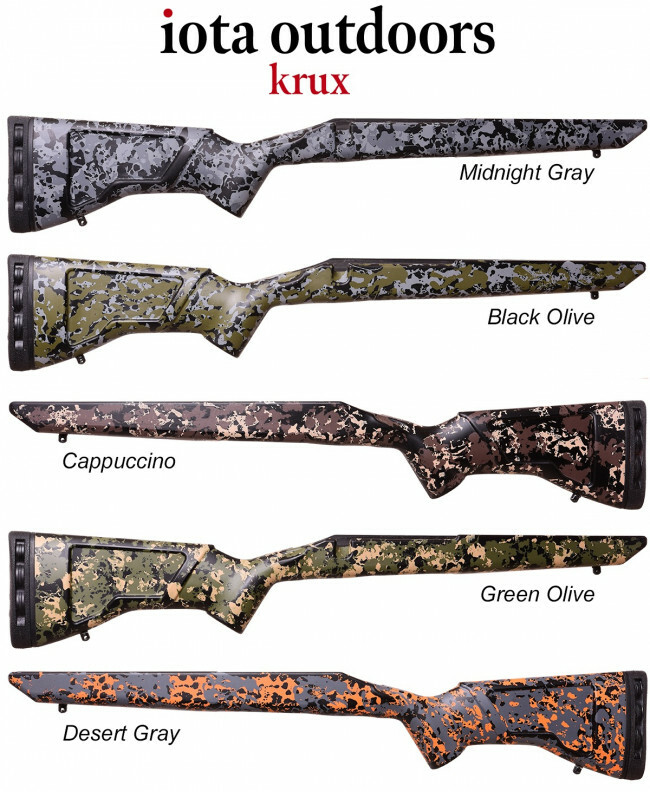 The iota KRUX is a sleek and agile hand layup rifle stock reinforced with a carbon fiber core that's lightweight yet is able to accomodate a wide variety of barrel diameters from lightweight sporter all the way up to Proof Research Sendero (M24). Carbon fiber reinforced composite mold maximizes the rifle stock's strength under compression of fully equipped rifle. Custom Machined pillars to maintain proper action and bottom metal dimensions, reducing stock fatigue and maintaining accuracy. Custom AirTech recoil pad made from LimbSaver’s proprietary NAVCOM technology effectively absorbs a wide range of frequencies to dissipate energy and vibration. Matte texture with a variety of molded in color schemes, molded in ports, and hand laid for a premium quality and look. 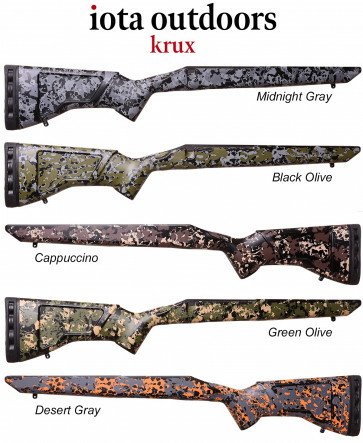 Weighing in at a mere 27 ounces and 28" in length, the iota KRUX is the perfect stock for a backcountry rifle build. The low-profile composite rifle stock is sleek and agile. In-Stock Length of Pull: 13.5"